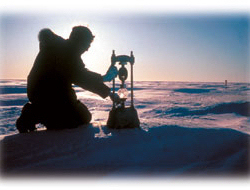 SPRI's mission is to enhance the understanding of the polar regions through scholarly research and publication, educating new generations of polar researchers, caring for and making accessible its collections, and projecting the history and environmental significance of the polar regions to the wider community. 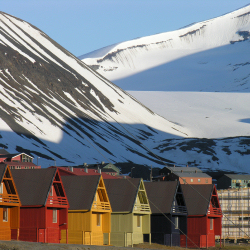 We investigate a range of issues in the environmental sciences, social sciences, arts and humanities of relevance to the Arctic and Antarctica. SPRI has a friendly community of postgraduate students, working for the PhD degree or the MPhil in Polar Studies. The Scott Polar Research Institute holds a unique collection illustrating polar exploration, history and science. Find out how past discoveries in the Arctic and Antarctic help today's scientists to investigate our changing environment. SPRI's staff publish regularly in a range of leading journals, and attract research funding from a wide variety of sources. 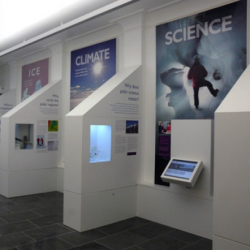 The Library offers a collection with over 700 current journals and over 250,000 printed works covering all subjects relating to the Arctic, the Antarctic, and to ice and snow wherever found. PhD student, Emily Potter, with supervisors Ian Willis (SPRI), Andrew Orr (BAS) and colleagues have published their latest research in the Journal of Geophysical Research, which has also been featured as an Editors' Highlight in EOS. The work uses field measurements and a regional climate model to determine the patterns and causes of wind acceleration around the Khumbu Valley, Nepal, and how they change over diurnal cycles, and between the monsoon and dry seasons. It confirms strong daytime up-valley winds and weak nighttime winds in both seasons, and shows that pressure gradient forces are the dominant cause of wind acceleration, but that turbulence and advection are important too. The forcing terms are highly variable across the valley, and also strongly influenced by the presence of glaciers. When glaciers are removed from the model in the monsoon run, the wind continues much further up the valley, showing how local valley winds might respond to future glacier shrinkage. This work will help the development of regional climate models in the Hindu-Kush Karakoram Himalaya, which are crucial for predicting future precipitation and glacier melt in the region. Following a programme of pioneering Antarctic scientific research, and successfully reaching the Endurance wreck site, as plotted 104 years ago by Frank Worsley, the Weddell Sea Expedition team have sadly been forced to conclude the current search for the Endurance. A team of British and American researchers, co-led by Alison Banwell and Ian Willis at the Scott Polar Research Institute, has measured how much the McMurdo ice shelf in Antarctica flexes in response to the filling and draining of meltwater lakes on its surface. This type of flexing had been hypothesised before and simulated by computer models, but this is the first time the phenomenon has been measured in the field. The results are reported in the journal Nature Communications. .Is the North Pole still important, when most of us will never visit it and know almost nothing about it? A new book by Dr Michael Bravo charts the history of the North Pole and finds a place that is both real and imaginary, with fascinating stories to tell. Calling all Polar Educators and Researchers! 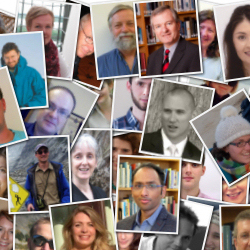 Registration to take part in the Polar Educators International 2019 Conference is now open. 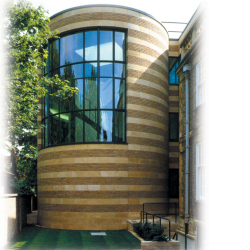 The 4th biennial workshop takes place in Cambridge, at the Scott Polar Research Institute and Christ's College, and will discuss 'Education and Polar Science in Action'. Find out more and book your place.